USPA NEWS - Philanthropists, Conservationists and Environmentalists were joined by Stars from the Worlds of Screen, Fashion, Art and Music in Monaco on September 26. Gathering together on the Stunning Terraces of the Monte-Carlo Opera, to raise Funds and Awareness for the Future of a Sustainable Ocean, overseen by the Prince Albert II of Monaco Foundation. The Live Auction saw a Staggering 21 Million Euros raised on the Evening, while Funds continue to rise as the Online Auction is ongoing until 4pm CET on Thursday 11 October. Philanthropists, Conservationists and Environmentalists were joined by Stars from the Worlds of Screen, Fashion, Art and Music in Monaco on September 26. Gathering together on the Stunning Terraces of the Monte-Carlo Opera, to raise Funds and Awareness for the Future of a Sustainable Ocean, overseen by the Prince Albert II of Monaco Foundation. The Live Auction saw a Staggering 21 Million Euros raised on the Evening, while Funds continue to rise as the Online Auction is ongoing until 4pm CET on Thursday 11 October. Presided by HSH Prince Albert II of Monaco accompanied by his wife HSH Princess Charlene of Monaco; and hosted by Milutin Gatsby, Global Fundraising Chairman, the Evening also saw Orlando Bloom presented with the 'Prince Albert II of Monaco Foundation Special Award’ in recognition of his Environmental Awareness Campaigning. Accepting the Award from the Sovereign, Orlando Bloom said: “The Urgency of Climate Change has never rung Louder than it is Now. The Science is Clear. And what will they say of us, a Hundred Years from Now, since we knew but sat and did Nothing ? The World is changing, and we need to change our Habits along with it. Thanks to the Extraordinary Generosity of the Gala’s 720 Guests and Bidders from around the Globe, the 21 Million Euros raised over the Evening, combined with the Additional Funds from the ongoing Online Auction, enables the Foundation to continue supporting Vital Research, Education and Conservation Initiatives Worldwide which are Essential for the Future of the Global Ocean. Commencing the Evening, Guests enjoyed Cocktails whilst viewing the Collection of 47 Live-Auction Lots on Display, reflected by the Grandeur of the Opéra De Monte-Carlo Backdrop. Lots included the World’s First Luxury Electric Powerboat; the Opportunity to go Horseback Riding with Madonna and surfing with the Legendary Kelly Slater at his Surf Ranch in California. Entering the dinner via a nautical themed portal, based on Captain Nemo’s vessel Nautilus, guests were transported into an undersea realm under the stars complete with floating jellyfish chandeliers. Bio Michelin Star Chef, Paolo Sari, created a Gastronomic Extravaganza reflecting the Gala’s Ethos with Completely Organic and Responsibly Sustained Ingredients from the Sea and Land, including the Wines and Water. A Mediterranean Fish Bouquet followed a Mousse of Monaco’s Smoked Black Ruff ; with a Filet de Turbot Rissolé aux Chanterelles and Sturgeon Pearls served as the Plat Principal. Rounding off the Menu were Côte d’Azur ‘Red Berries from a Wednesday at the End of September’. Entertaining the Diners, the Legendary Nile Rodgers & CHIC previewed Tracks from their First Album in 25 Years “It’s About Time”, while GRAMMY Awarded Queen of Disco, Gloria Gaynor, also rocked the Room. Robert Davi reprised his Frank Sinatra Tribute, while Supernatural Entertainer Lior Suchard drew Gasps of Surprise from the Audience, before Rap Duo Madcon rounded out the Evening. In between Performances, World Renowned Auctioneer Simon de Pury led the Exceptional Auction, the Proceeds of which will support the Foundation’s Priority Marine Programmes : Plastic Pollution, Scientific Studies on Acidification, Coral Protection, Marine Protected Areas, Endangered Species and Innovative Technologies. 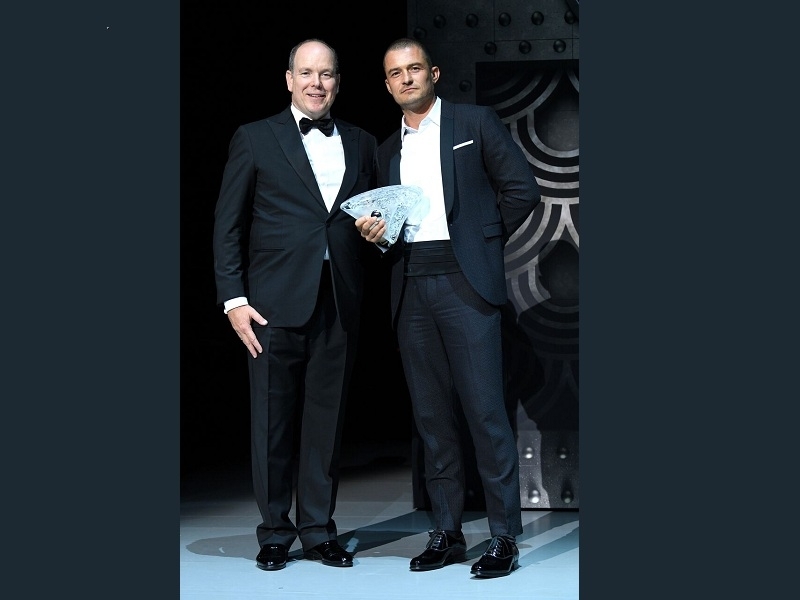 Celebrations continued into the Early Hours at the Monte-Carlo Casino, with the Gala After-Party hosted by Richie Akiva and 10AK, and Famed Jazz Pianist ELEW giving a High-Octane Performance for Guests dancing the Night Away.